What leaves a trail like this? I was trig bagging yesterday in the Dales – which for me means wandering off the beaten track now that I’ve bagged all the obvious ones, all the ones at the top of the main hills and all the ones on the well worn routes. 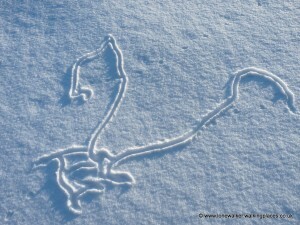 I was climbing away from Cam Houses, up the side of Cam Rakes – the snow is still well packed here, but it now has a fresh coating of about 3 inches on top, so the passage of every living thing for the last two days was clear and obvious – and I came across this track. Now it’s fairly easy to spot all the obvious tracks; rabbits walking, rabbits running, grouse and pheasants, field mice and even weasels, but this one has me stumped. Any ideas? As you can see, it stands on its own. There were no human prints leading up to it (other than mine of course) and there seem to be tiny prints leading away from it. I suspect this is some sort of behaviour rather than a track, possibly of a field mouse or similar. Next story Memory Map on the iPhone – continued..